Mehdi Alaoui created his first mobile app in 2001, succeeded in gathering 50,000 members on his dating app in 2003, and since 2006 has been developing apps for big companies in Europe and the MENA region through his agency, Media Mobility. So when the successful Moroccan entrepreneur tells us that the future is in platforms allowing people to create their own apps, we say that he might be onto something. Unlike Mobibus, which allows users to create multilingual apps through templates, ScreenDy, a new service on the Media Mobility menu, is an online studio to create totally customized native apps without any coding. ScreenDy is designed for web agencies trapped between hiring developers and using unreliable subcontractors. With ScreenDy, web agencies can create their own apps with an e-studio using drag & drop. Agencies are charged once the app is online on different stores, allowing them to offer several apps to their clients, with the client choosing their favorite. Agencies can then manage the apps’ maintenance independently, designed to save them money and time. The app is currently in a private beta version and will be available June 15th in a public beta version (register here). During this first phase, the team spends a total of 24 hours with their clients to assist them in creating their first app, and to better understand how clients use the app and what they need. Mehdi Alaoui explains: “we look at [clients’] model and design, then we explain how to create the app through our studio.” But, he says, “our objective is to totally disappear” after this initial beta phase. But if they choose, agencies can delegate their maintenance to ScreenDy. It all began with internal need. In 2011, Media Mobility decided to create a framework to save time while creating apps internally. 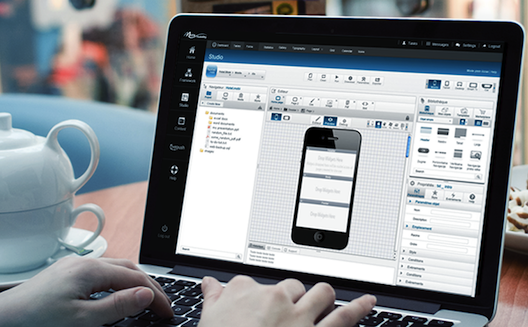 In 2012, the agency noted a skyrocketing demand for app creation agencies. Realizing their existing internal product was innovative enough to be disruptive, in that it would automate a process for the general public that usually requires significant manpower and time, the Media Mobility team decided to concentrate on its software full-time, shifting from individual creation software to being a service vendor. At its peak, the agency employed 30 people working on product development. As that work wound down, the company reduced its staff to a dozen people. The company, whose headquarters are in Paris but has development offices in Casablanca, decided to offer particularly low fixed prices in an attempt to get as many customers as possible. It plans first to flood the MENA market via the commercial office in Dubai, expanding then to Europe, starting with France. The team also expects to make a U.S. trip at the end of the month to present the product and find investors.